Side by side with peat moss, coco coir is one of the most commonly used media in hydroponic culture. Its excellent root propagation and aeration properties, coupled with its adequate water retention, make it an ideal media for hydroponic culture. Nonetheless there are several issues that can arise when using coco coir, particularly due to its chemistry and variability. Today we are going to talk about using coco coir in hydroponics, what the main problems with coco can be and how these problems can be avoided. Coco coir is basically ground up dried palm tree husks. Although it is organic it is much more fibrous than peat moss and therefore it does not suffer from some of the pH and decomposition issues commonly found with peat. Although coco is biodegradable its decomposition can take more than 20 years, reason why it is a suitable media for hydroponics. It can even be used several times within a hydroponic crop in order to save production costs. Since coco coir comes from large plants grown across a variety of different conditions the actual chemical makeup of the coco can change very substantially. 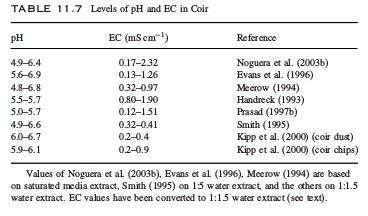 The table above shows the pH and EC of different coco coir sources. As you can see we have everything from an EC of 0.1 mS/cm to an EC of 0.9 msS/cm, with pH values that cover anything from 4.9 to 6.8. This is mainly due to the big variations in the ions contained within the coco and how these ions interact with the plant material. This media also has a high cation exchange capacity meaning that it can retain large amounts of ions that are only taken out whenever they are replaced by others with stronger affinity for the media or when strong interactions with chelating agents within the media are possible. This is generally why coco is treated with calcium nitrate solutions, to remove many of these nutrients from the media structure and allow the media to be as neutral as possible when used in hydroponic culture. However many coco producers do not treat the media at all - or simply wash it with plain water - leaving a lot of potassium and sodium within the media that needs to be accounted for plus a lot of micro nutrients that are tightly bonded to cation exchange sites. If you want to ensure your coco is as neutral as possible in terms of nutrients you can extract it with a 1 g/L solution of calcium nitrate and then with 2g/L of tetrasodium EDTA. This will extract both macronutrients that are exchangeable for Calcium and micro nutrients that can be extracted when using EDTA. The EDTA step is important as coco can hold a large amount of micro nutrients within it that can be exchanged and used by the plant. If you want your nutrients to all come from solution you will need to remove these contributions from the media. After this you will then want to run plain water to remove any excess Ca and EDTA and then run your full strength nutrient solution for a few days. This will strip the coco from ions and then it will equilibrate the cation exchange sites with your nutrient solution's composition. However these steps clearly aren't necessary to grow successfully with coco but just give the grower more control over the nutrients received by the plants. You can alternatively run nutrient solution through the coco and then perform an analysis of the output so that you can compensate the nutrients that are given by the coco through the growth cycle. This of course means that you need to spend money doing solution analysis through the crop to ensure that you're adequately compensating the level of contributions from coco through the entire growing period. When properly treated coco can be a very good media for growing hydroponic crops. The bigger aeration, biodegradability and fibrous structure makes it better for root growth than most peat moss sources and yields for several plants are often bigger or just as good in coco when compared with peat moss. The lack of important decomposition during growth cycles is also a big advantage over peat as important drops in pH due to media decomposition can be avoided. You said about "1 g/L solution of calcium nitrate and then with 2g/L of tetrasodium EDTA" but could you please tell me How much quantity of coir has to be treated with every 1g/L solution of calcium nitrate and the remaining? Once again, very nice article. Great information. However, I'm wondering if the calcium would preferably be chelated by the EDTA before the metals. If I understand your reasoning, the calcium would displace potassium and sodium held by exchangeable CEC sites. On the other hand, I guess not, after looking at stability constants that Ca-EDTA is lower than Fe, Cu, Zn, Mn, Co.
Another thought: EDTA is phytotoxic at certain concentrations. Have you ever seen plant damage after using this method? And, how are you verifying you're flushed out all the EDTA? I've never had problems with EDTA toxicity when doing this, EDTA is always Ca chelated (due to the use of Ca nitrate as well) and the toxicity of Ca EDTA is orders of magnitude less than that of unchelated EDTA. Initially the EDTA will bind to the Ca but the equilibrium constant with the metals like Fe, Cu, Zn, etc is so large (many orders of magnitude larger than that of the constant with Ca) that Ca EDTA will simply get displaced for any heavy metal chelates. The Ca will displace any K/Na in cation exchange sites and EDTA will basically bind any heavy metals and take them out as well. EDTA toxicity is strongly reduced by the fact that any left over EDTA - any excess that does not chelate heavy metals - remains chelated to Ca in any case. Very nice, thanks for the explanation.